Barra: "We're no longer just looking for viability. We're looking for growth and leadership in the operations..."
DETROIT -- General Motors CEO Mary Barra said she plans "no right or left turns" from the path laid out by her predecessor, and expects to accelerate the company's turnaround in part through better integration of its regional operations around the globe. The tenure of former CEO Dan Akerson was focused on "making sure we had the solid foundation," Barra told reporters on Thursday during a media roundtable at GM's headquarters here. "We're no longer just looking for viability," she said. "We're looking for growth and leadership in the operations that we have around the globe." Barra spent two days this week in suburban Detroit meeting with GM's top 300 executives from around the world. She said the group focused on the how the company's new reporting structure will lead to improved results and how GM can use innovation to "accelerate" GM's momentum. Barra, 52, took over from Akerson last week, becoming the first female CEO of a global automaker. The briefing today marked her first in-depth public comments since her appointment about her vision for her company. Barra said that the executive group spent a lot of time discussing the role of Dan Ammann, 41, the former CFO who took over the newly created position of president last week. GM's regional presidents and the chiefs of the company's two most important brands, Chevrolet and Cadillac, will report to him. Barra said she was heavily involved in shaping the scope of Ammann's role, which she said will help GM to share best practices among regions and brands. Historically, GM's regional chiefs have operated autonomously, a structure that executives have said created "fiefdoms" that led to inefficiencies and added costs. "There's good pockets of things going on," Barra said. "If we can just make sure there is quick sharing, we think we can strengthen the regions and make sure we manage the brands in a global sense." She added that the position of former Cummins Inc. CEO Tim Solso as non-executive chairman gives GM's new structure the benefit of a "knowledgeable and seasoned" executive to guide the board. Barra said she has had "weekly interface" with Solso since her appointment last month. Other than a brief period after GM's 2009 bankruptcy, the company hasn't had a nonexecutive chairman in nearly 20 years. "It's the perfect structure to have right now, to have somebody who's got that experience," she said. Barra reiterated the goals set under Akerson of returning GM's European Opel unit to break-even by mid-decade; increasing GM's North American profit margins to 10 percent by mid-decade; and maintaining GM's "fortress balance sheet" of light debt loads and ample cash to withstand cyclical downturns. She said she expects "modest" market share growth globally in 2014. GM CFO Chuck Stevens said last week that he expects the same for the U.S. market. GM's share was flat last year. 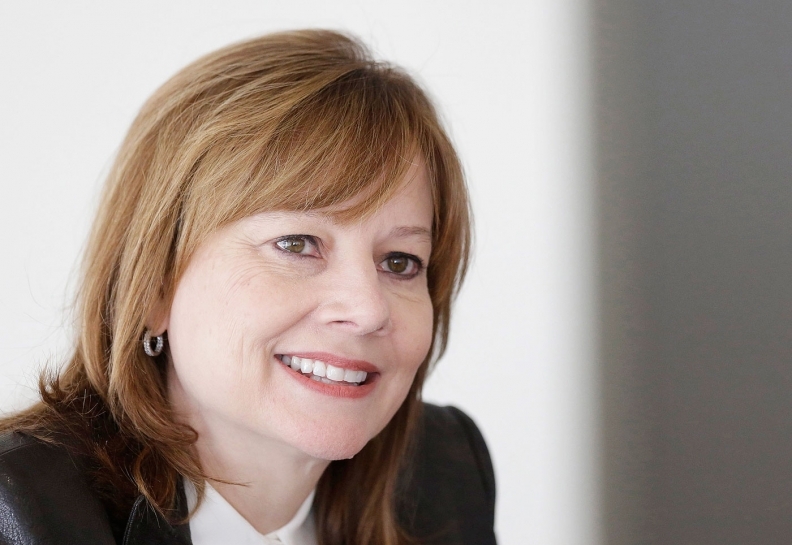 Barra said she believes the strength of GM's vehicle lineup will lead to long-term solid financial results, and that the company will not shift its market strategy from month to month to gain or protect market share. Maintaining pricing and production discipline "is very, very important," she said, "because it can be a very slippery slope down if you don't."